A trip to the memory, to recover those experiencies and pedagogical principles of Celestin Freinet in the Region of Murcia through their main characters. 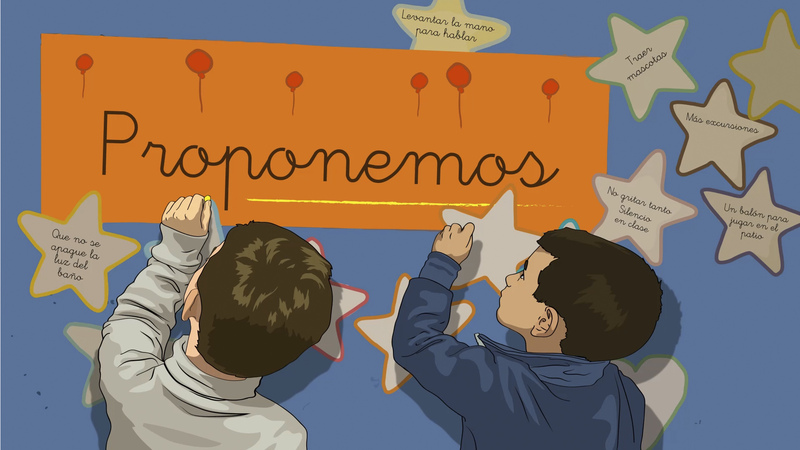 The Memory of the Hands is the first documentary film in Spain to be produced by a public university about public school. The Memory of the Hands is but a metaphor of what the university should be: teaching, research, innovation and transference of culture and cultural memory. The films wants to recover and preserve the teacher's educational memory who strove beyond what the education administration expected of them. This teachers worked so that their studients could be better citizens and people. They looked after the boys and girls so they could choose, take responsibility and cooperate. The heroes of our schools who are now a little less forgotten. Original title: La Memoria De Las Manos. Ecos del legado pedagógico de C. Freinet en Murcia. English title: The Memory of the Hands. Echoes of C. Freinet’s pedagogic legacy in Murcia. Animation Department: Alfonso Burgos, José María Laborda (CGI 3D), Adela Martínez Fernández-Delgado (scanning documents and slides); Alberto J. García García, María Garres Sánchez y Cristina Tapia Ros (Freinet’s rotoscoping drawing); Jorge González Carpintero, Carmen Jiménez Abellán y Verónica Cámara Beviá (Freinet’s rotoscoping colour). Techniques: CGI, Cut-out (digital), CGI 3d and rotoscoping. Cinematography: Isaac Rupérez Cano, Alfonso Burgos Risco. Camera operators: Antonio Gómez Gálvez, Fernando Bernabé Casas, Erica López Muñoz, Verónica Cámara Beviá. Film Time: The Memory of the Hands. Echoes of C. Freinet’s pedagogical legacy in Murcia is the story of those teachers who carried out the principles and techniques of Celestin Freinet in the Region of Murcia. In this way, there are three stages in the film: a contemporary review from time, through the research and the story of the student and the teachers; teachers experiences between the late seventies and eighties, when teachers performed their teaching experiences; and anecdotally, the representation of experiences and motivation of Celestin Freinet through rotoscoping of some sequences of the film “L’ecole Buissonniere” of Jean-Paul Le Chanois (1949). Film Space: The filmic space is constructed from the research of the pedagogy of Celestin Freinet formulated in a class located in the room 02 of Aulario Ginés de los Rios of the University of Murcia; the student attends interviews in C.E.I.P. ‘Virgen de la Fuensanta’ in La Alberca (Murcia), the archaeological remains of the Castle of Yecla, the C.E.I.P. ‘La Paz’ inYecla, the C.I.P.S. and S.E. ‘Escuela Equipo’ in Murcia, the C.E.I.P. ‘Narciso Yepes’ in Murcia, complementing the research at the Theory and History of Education’s Library of Department, Faculty of Education at the University of Murcia and the General Library in Campus Espinardo.